A Business of Your Own offers varied support information and services for entrepreneurs who have an unwavering passion to live a dream of addressing societal challenges. 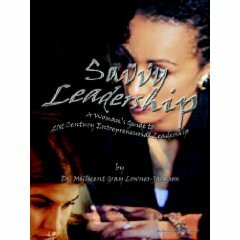 Our Savvy Leadership book is an ideal source for learning the nuts and bolts of being a Savvy Entrepreneurial Leader. We also offer seminars and workshops especially designed for social entrepreneurs. Also, our Business Knowledge Empowerment Section provides information for the day-to-day management aspects of a social entrepreneurial venture. A Business of Your Own offers dynamic, interactive seminars and training sessions for social entrepreneurial leaders. Seminars may also be designed specifically for the unique needs of a sponsoring organization. Please contact us for additional details at success@womaninbiz.com. Many of the Business Knowledge Empowerment Publications of A Business of Your Own provide easy to read, readily applicable, critical business information for social entrepreneurial success.